In generating session reports, it is sometimes useful to insert text in the report that is not related to a specific session. For instance, a description of an artist's move to another label may be useful previous to the first session done for that label. To support this, use the Report Notes window. 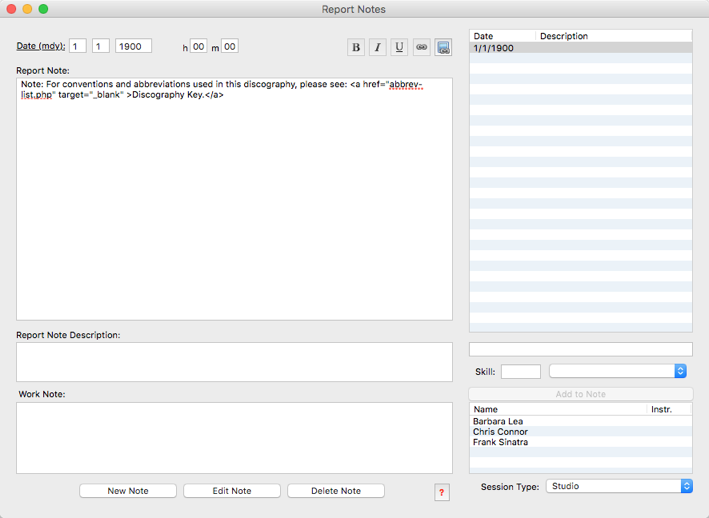 Use the date field to indicate placement of the notes in the report. The date is only used for sorting the notes, so any date can be used. Just pick one that is between the dates of the two sessions you want the notes placed between. In the case of multiple sessions with the same date, you can use the hour and minute fields to place the report note before or after a session. Performers must be entered so that the notes can be included with the appropriate discography. For instance, if you are including a notes-only session that pertains to the Chris Connor discography, then Chris Connor must be entered as personnel for the report note. You may want to create a special intro note that will apply generically to any discography you create. Multiple performers can be entered for a report note just as multiple performer can be entered for a regular session. In this case, enter a date for the report note that predates all the dates in your discographies. The Work Note entry is the same as the Work Note field for the session. It is strictly a note taking aid for the discographer and it will never appear on any public report.